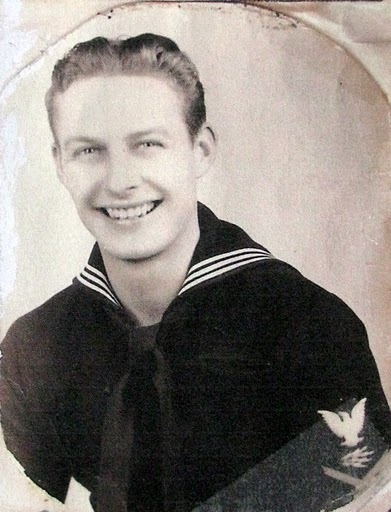 Electronics Technician 2nd Class Richard Berry of Venice served aboard the USS Hudson (DD-470), on picket duty off Iwo Jima and Okinawa during the closing months of World War II. Before the young sailor from Downing, Ohio went aboard the Fletcher Class destroyer she had seen action at Bougainville in the Solomon Islands, as well as Kaviengh and Rabaul in the Bismarck Archipelago. From there the Hudson took part in the invasions of Saipan, Guam and Palau. 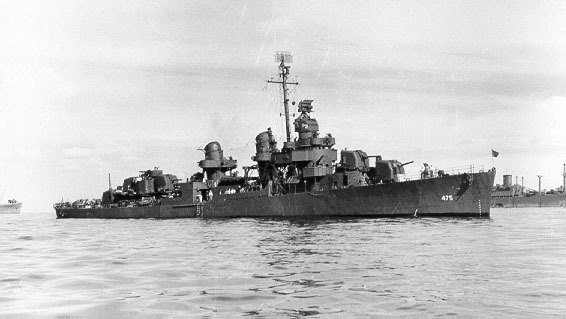 Altogether the destroyer was involved in nine major battles in the Pacific during the Second World War. Berry’s battle station aboard ship was at the radar unit. After the battle was over the Hudson headed for Saipan on convoy duty. The ship helped protect a convoy of wounded Marines. “We picked up radio contact with a B-29 bomber returning from Tokyo about 150 miles north of Saipan. The plane ran out of fuel and had to ditch in the sea,” Barry said. “When the Hudson arrived the bomber was nose down in the water with its tail broken off and its fuselage straight up in the air. Years later some of the bomber’s crew members attended the USS Hudson’s annual reunions held around the country after the war. “On March 15, 1945 the Hudson arrived at Leyte Gulf. Our destroyer patrolled the Surigao Strait when Gen. Douglas MacArthur landed on Mindanao in the Philippines. I was given two hours liberty on Samar Island. 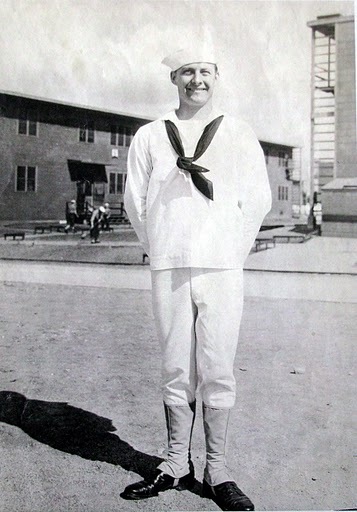 It was the only time I was off the Hudson from Jan. 26 until May 14, 1945 -100 days,” Berry recalled. “Off Okinawa on April 5, at 1 a.m. we made contact with a Jap submarine when it fired a torpedo that missed our ship. We made several depth charge runs on a sonar contact. “At 9 a.m. there was a terrific underwater explosion and the submarine disappeared on sonar. An oil slick five miles long with many small particles appeared on the surface. The Hudson was later given credit for sinking the Jap sub,” he said. Kamikaze attacks off Okinawa were so prevalent and so successful 13 of the 20 destroyers on picket duty in Berry’s squadron were sunk by the suicide planes during the last major battle in the Pacific. It was May 3, 1945 and the Hudson was on picket station south of Okinawa near Kerama Retto Island when the war heated up for the sailors aboard his ship. “Four Marine fighter planes under our control shot down 11 Jap fighters. It was about this time a Jap bomber hit the carrier USS Sangaman’s flight deck that was sailing near by. The ship burst into flames of molten metal,” he said. Four times while the carrier was still on fire from the direct hit of the Japanese bomber the Hudson pulled along side the Sangaman and attempted to help put out the blaze aboard the carrier. As a consequence the crew of the Hudson received a Navy Unit Commendation for its actions. After 108 days at sea the Hudson sailed into Guam for repairs to her superstructure following the kamikaze attacks. She sailed for Eniwetok arriving on July 19. After he was discharged from the Navy he coached football and basketball at Troy State in Ohio for a couple of years, but decided coaching didn’t pay well enough. Berry went back to school and got a degree in electrical engineering. 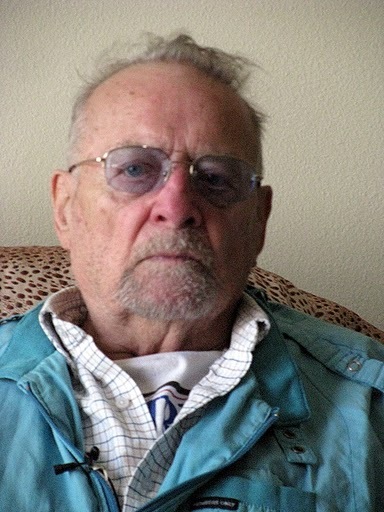 Then he worked for years with RCA installing electrical systems in aircraft carriers and submarines. Berry retired to Venice a couple of years ago. His wife, Joanne and one son, Dennis, have passed away. Debra, his oldest, and David, who live in Sarasota, survive. This story was first printed in the Charlotte Sun newspaper, Port Charlotte, Fla. on Thursday, Dec. 23, 2010 and is republished with permission. Click here to view Berry’s Collection in the Library of Congress’ Veterans History Project. 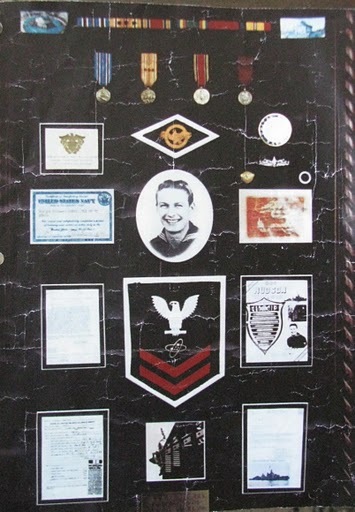 the picture at the top is of a 3rd class radioman not an ET which I don’t believed was a rate inWW2. The hull# for Hudson was DD475.